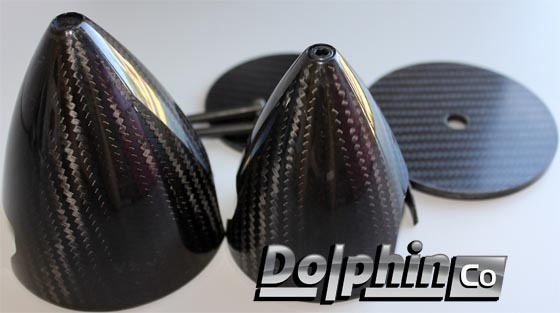 Click the button below to add the Carbon Fiber Spinner 1.75"-7" to your wish list. 4mm for 1.75" - 2.5"
The 4.5" spinner appears very well made. Although moulded as a two-piece unit, both the inside and outside join is perfect, as are the cutouts for a 2-blade prop. The spinner joins the baseplate very neatly with a mating flange on both surfaces to hold the two firmly together. There is no adaptor supplied, although the nosecone tip has a recess and hole for a sizeable mounting bolt. I've been unable to check the static balance as this unit is too long for my hi-point balancer, but the skin thickness appears very even and no flaws are visible. Spinner with baseplate weighs just 90 grams. All considered, this is a very nicely made unit at a very reasonable price.